Help Center2. Help2.2 GlossaryWhat is a TOPOJSON file? What is a KML File? What is a MIF file? What is a TAB file? What is a TOPOJSON file? A TopoJSON file format is a format that encodes topology. 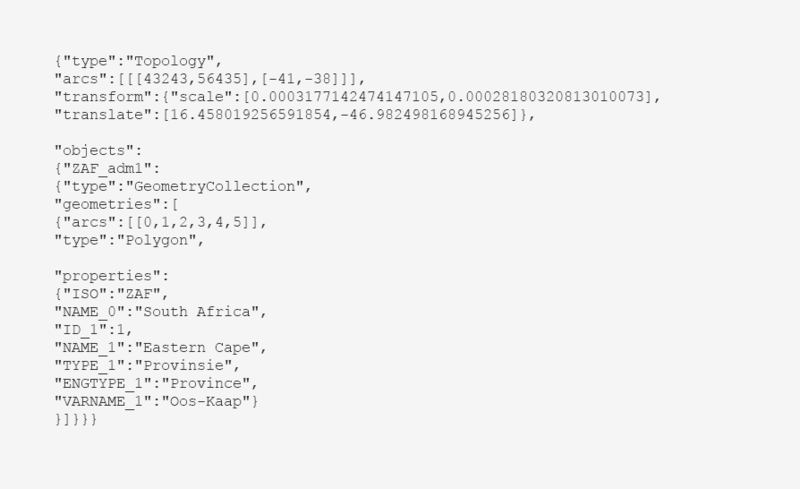 TopoJSON is an extension of geoJSON. This format contains both geospatial data (arcs) and attribute data. In contrast to other GIS formats topoJSON uses arcs. Arcs are sequences of points, while line strings and polygons are defined as sequences of arcs. Each arc is defined only once, but can be referenced several times by different shapes, thus reducing redundancy and decreasing the file size. The topoJSON format is a format that is used by software like Microsoft PowerBI. What software opens a TOPOJSON? The last part includes more information about the attribute.